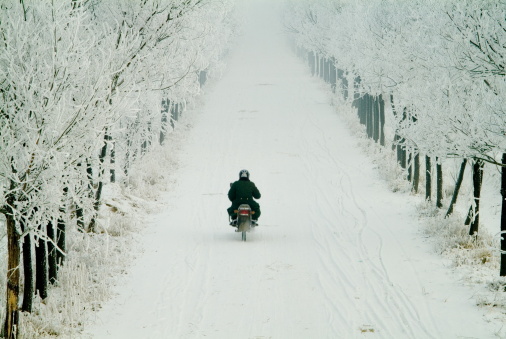 With the official start of winter just weeks away, many motorcyclists are forced to park their bikes in storage for the season, but chances are, if you live in a state that gets little to no traces of snow, you are still sharing the road with year- round motorcyclists. While even the hardiest of bikers tend to take a break when the weather gets too cold or the roads become too icy, you, as a driver, should still practice safe driving and watch for all kinds of motorists, including motorcyclists. Despite the ongoing efforts to keep collisions with motorcycles low, motorcyclist traffic fatalities continue to increase each year. Even the smallest of accidents with a motorcycle can have severe results; remember that motorcyclists have less protection than vehicle drivers, which is all the more reason to pay extra attention when sharing the road with a motorcyclist. While motorcycle accidents occur for any number of reasons, including road conditions, weather, or the motorcyclist himself, many motorcyclist fatalities result from collisions with other vehicles. According to the Governors Highway Safety Association (GHSA), preliminary data suggests a projected 9% increase in motorcyclist fatalities between 2012 and 2013. Additionally, motorcyclist fatalities have increased in 34 states and decreased in 9 states, but the overall results suggest a significant increase of almost 3,000 since the year 2000. Just like any motorist accident, there aren’t always clear answers and they occur for any number of reasons, especially with the ever increasing population of cars on U.S. roadways. Many drivers, particularly in larger cities, spend more hours on the road and as a result, more vehicles take up road space during the day and into the nighttime hours. The GHSA suggests that one of the reasons that motorcycles have become more prevalent is due to the rising prices of gasoline. For some motorists, motorcycles are the cheapest way to travel, but sometimes with a cost: unsafe travel and a greater risk of being involved in an accident with another vehicle. The best way, as a motorcyclist and a driver, to avoid being involved in a collision is to share the road and pay attention to your driving. Practice the “Look Twice” Rule. Motorcyclists are often hard to spot at intersections, in your mirrors or in your blind spots until it’s too late. Always take the time to look and then look again. Don’t Be a Bully. When a motorcycle is trying to pass a driver, some drivers speed up or try to make it difficult for a motorcyclist to pass safely. This type of behavior can be categorized as aggressive driving. Motorcyclists can lose control of their bike more quickly than a driver can with a vehicle. Additionally, don’t tailgate a motorcycle. Wouldn’t it be terrible to see a rider fly onto your windshield because you were driving too close? While drivers are responsible for looking out for you, you (as a motorcyclist) should take the initiative to look around. Don’t assume that you are easy-to-spot. To make you more visible, try to wear brightly colored clothing or reflective gear. Don’t Try to Be a Hotshot! Don’t like feeling bullied while you’re on your bike? Don’t bully other motorists. Reconsider Riding if the Roads are Bad. Road conditions can change quickly if the weather is anything less than perfect or due to oil slicks or potholes. Unlike cars, motorcycles are as resilient to inclement weather or poor road conditions. Your safe navigation relies on you and your ability to operate your bike safely, wisely and with a clear mind (don’t ride drunk). While our roads become more crowded with various motorists each day, it is possible to stay safe while traveling to and from destinations. Whether you are a long-haul truck driver or a Harley rider, it’s important to follow all of your state’s traffic laws, in addition to paying special attention to drivers around you. Enjoy the ride and arrive alive. Next post: What is the National Accounts System?